This stylish costume riffs on classic pirate themes, and creates a look that any little lady would be proud to wear to sea. The slacks are a red and blacked stripe and matching red head tie will warn your opposition that you mean business. 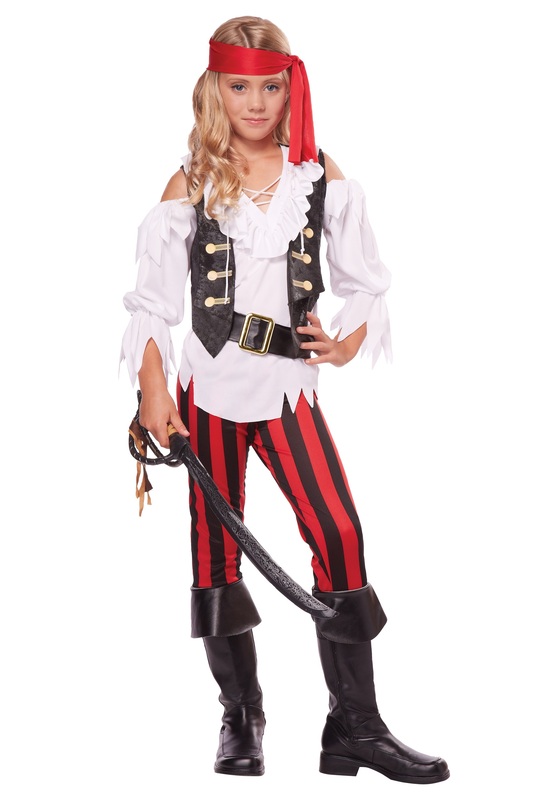 A stylish period peasant-style blouse has sewn on faux leather that gives a perfect contrast as well as the look of a gal who is more than prepared for a bit of swashbuckling on the gangplanks. Be sure to pick up a weapon accessory, though, just in case some barnswaggle is foolish enough to try! When she signs up for adventure with this classic costume, the only thing she'll have to worry about is where to find good island to stash all that treasure on!